For capsicum lovers like me, anything with capsicum will taste good. One of my fav capsicum dish is Stuffed Capsicum. Different kind of stuffing we can make for this, like potato, besan flour, bread, etc. 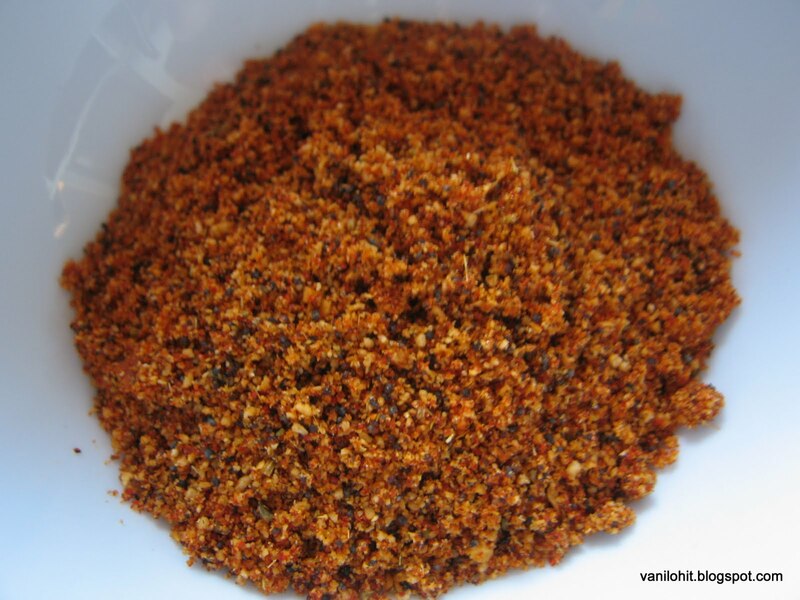 My mom and aunt will use the coarse masala powder prepared using chana dal. 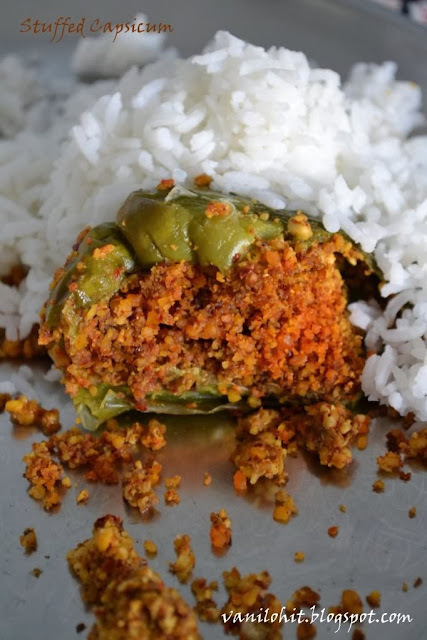 It tastes awesome with both chapathi and rice. Dry roast all the spices and make a coarse powder. Add salt and amchur powder to taste. Make a round hole on the top of capsicum by removing the stem. Remove the seeds if any, inside the capsicum. 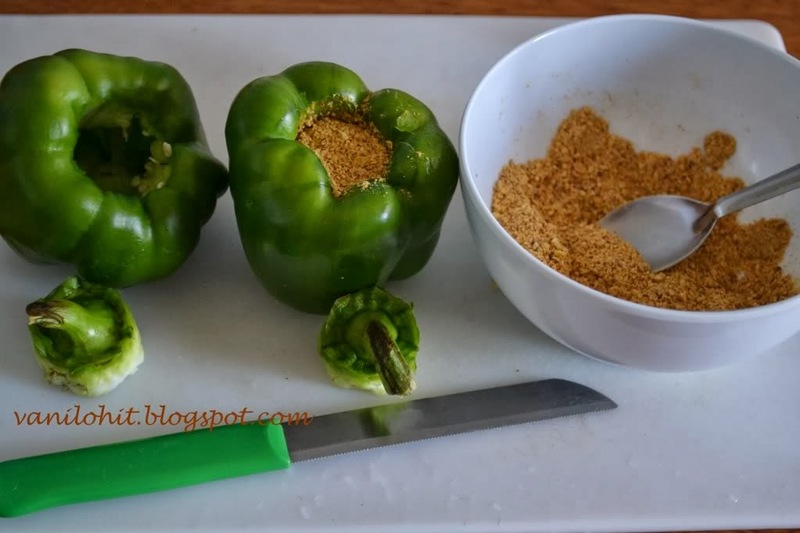 Fill the capsicum with masala powder and close the hole with the stem. Heat the oil in a heavy bottom pan. Once the oil is moderately hot, put the capsicum in the oil for cooking. Pour 1 - 2 spoons of oil on the top of the capsicum and let the oil go inside the capsicum. Close the lid and cook the capsicum. Turn the capsicum few times occasionally to cook from all the sides. Be careful while opening the lid because oil will be spluttering because of the water content in the capsicum. Once the capsicum is cooked fully, take it from the oil and serve with chapathi or rice. 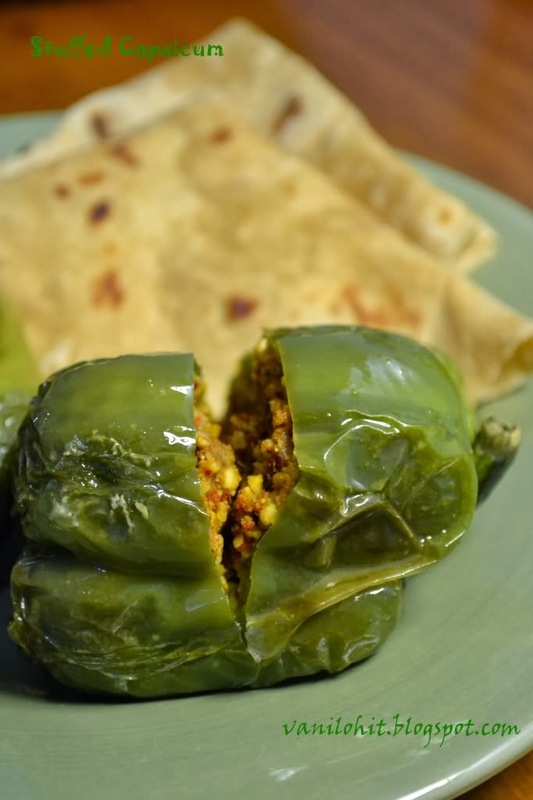 Its better to use medium or small size capsicum for stuffing. It makes them easy to cook. Mix all purpose flour, carom seeds and salt in a mixing bowl. Add oil or ghee and mix it well till it become like bread crumbs. Add water little by little and prepare a soft, non - sticky dough. Prepare lemon size balls and roll it like chapathi. Fold it twice and make a triangle. Roll it again and fold it. Do it for 4 - 5 times to get more layers. 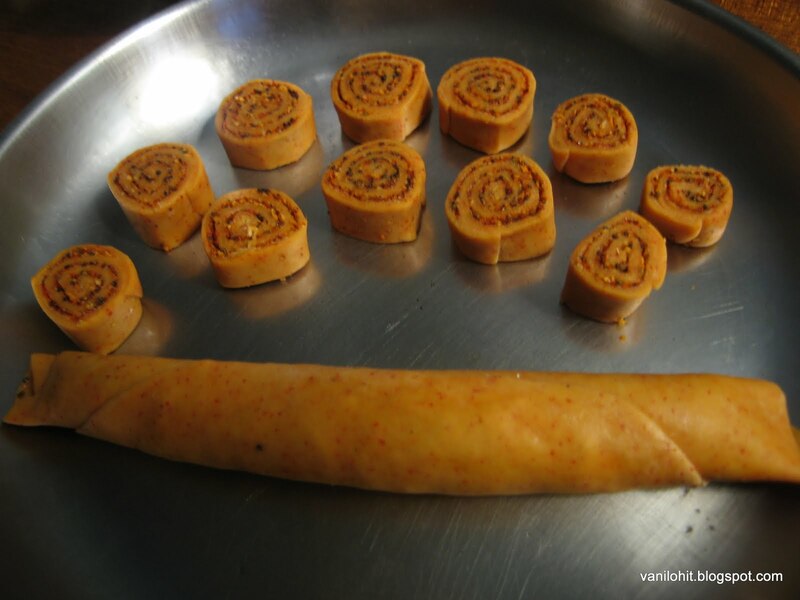 Finally, roll it little thicker than chapathi and cut into desired shapes. 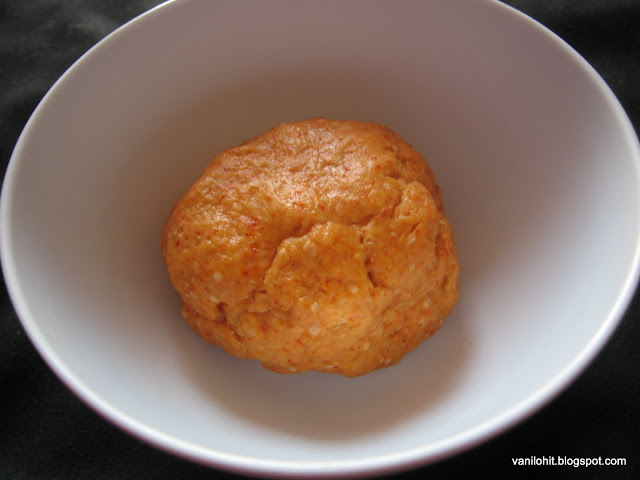 Else, make small balls of the dough and roll them like small poori. Apply little oil and sprinkle some dry flour on rolled poori and fold it into triangle. 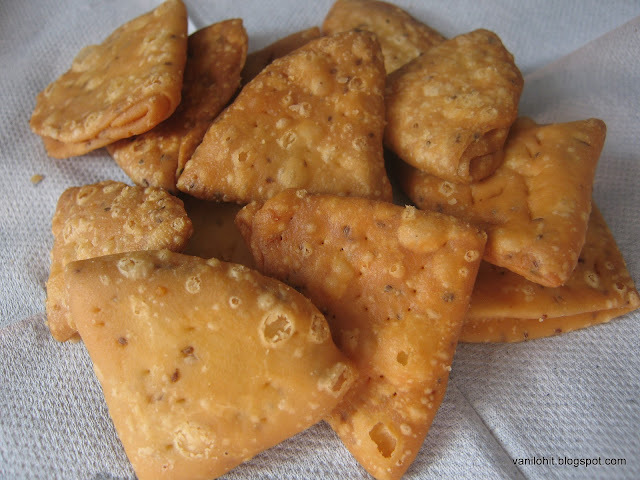 Prick the papri pieces with a fork and deep fry them on low or medium flame till golden brown. 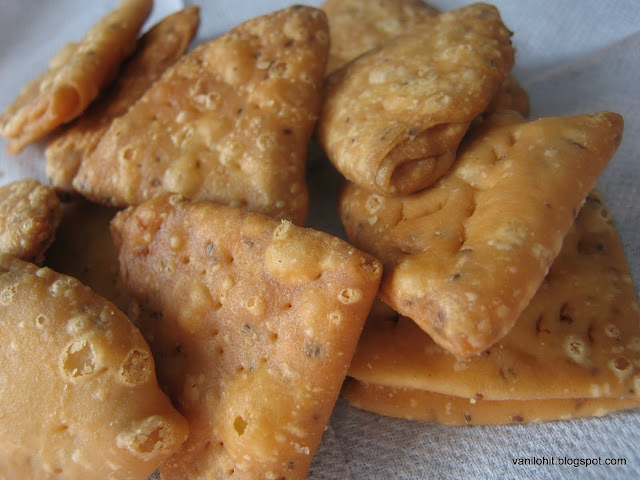 Transfer the deep fried papri onto a tissue paper for cooling. Store the Papris in an air tight container and use them for preparing chaat items. 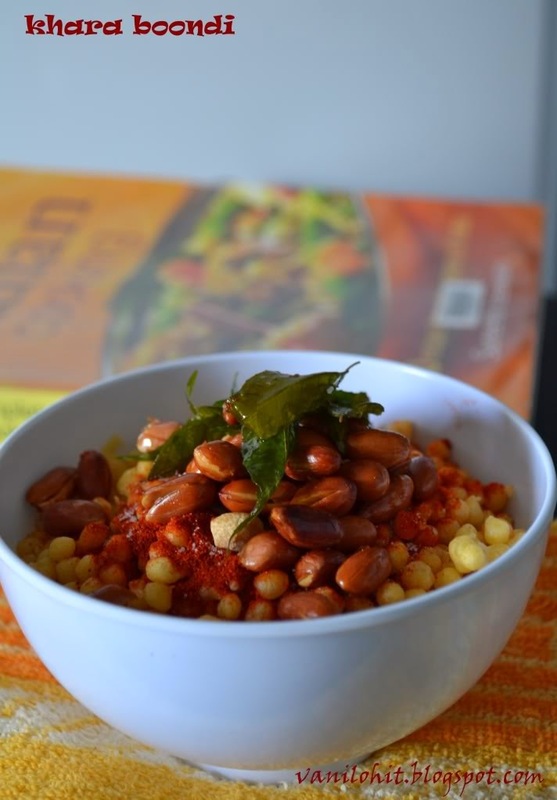 Soak chana dal for at-least 1 hour. Heat around 1 spoon of oil in a pan. Add mustard seeds and let it splutter. Then, add chopped green chillies and saute for a minute. Add soaked chana dal and asafoetida. Add salt and 1/4th cup of water. Cook it closed for 5 minutes and saute it 1 - 2 times occasionally. Once the chana dal is 3/4th cooked and the water is evaporated, switch off the flame and add lime squeeze and chopped coriander leaves. Serve it hot with a cup of tea! 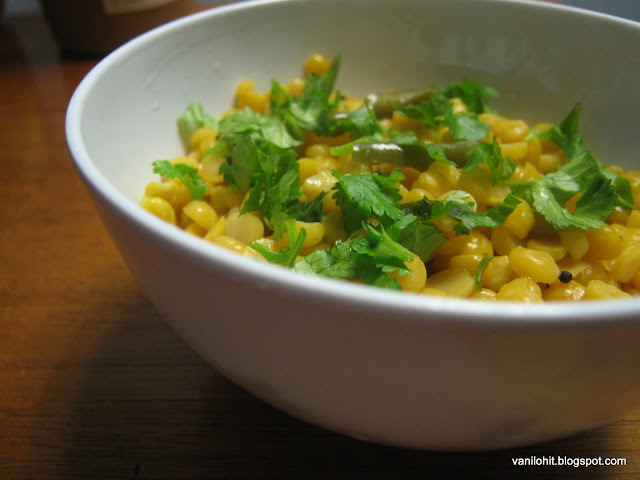 Don't cook the chana dal till very soft. Otherwise, it will not be nice to eat. Seven Cup Burfi (Halva) / ಸೆವೆನ್ ಕಪ್ ಬರ್ಫಿ & Awards! This Burfi is called as Seven Cup Burfi because its prepared using totally seven cup of different ingredients. 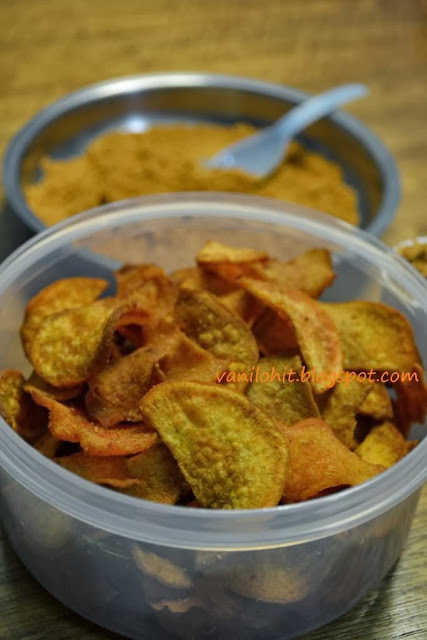 Normally, it will be prepared using Besan flour, but I have replaced it with sooji rava / semolina in this recipe. My aunt prepares the burfi in this way, which will be very tasty :P Also, another variation I made here is that, I have used only 6 1/2 cups of ingredients.. i.e., I have reduced the quantity of sugar by 1/2 cup. Somehow, I feel that it will be too sweetish if whole 3 cups of sugar is added. That's why, this small variation in the original recipe! Take a heavy bottom pan and pour ghee and semolina into it. Roast the semolina for 4 - 5 minutes and add milk, sugar and grated coconut. Keep stirring continuously on medium flame to avoid sticking to the bottom. Keep a wide plate ready, greased with ghee to pour the Burfi mixture. 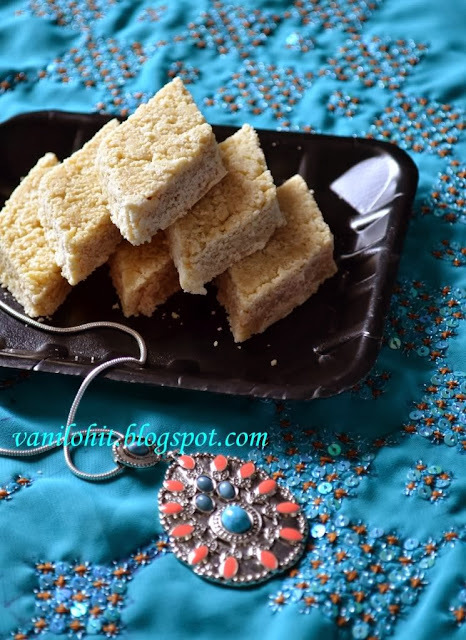 After stirring for sometime on medium flame, water content in the burfi mixture will start decreasing and it starts forming a kind of dough, without sticking to the bottom. Once you reach this stage, you can confirm yourself that 3/4th of your work is done! Within few minutes, mixture starts puffing up little-bit and small bubbles will appear. Switch off the flame immediately and pour the mixture onto the greased plate. Spread the mixture evenly using a rolling pin. Allow it to cool for few minutes. Cut it into desired shapes when it is still warm. Transfer the Burfi into an airtight container once it is cool. If the burfi mixture has stuck to the bottom, pour the mixture to another pan and continue the process. Else, it will spoil the whole burfi mixture. 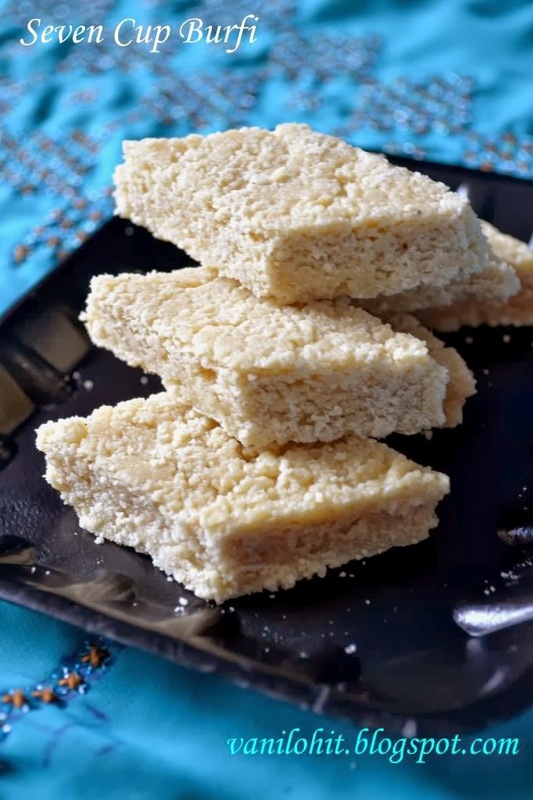 Use only fresh ghee without any bad smell for this burfi. Adding a few strands of saffron will make this burfi more tasty. And one more thing is, my dear friend Julie has passed me 2 Awards :) First award for me..I'm feeling so happy <:-P Do visit Julie's space sometime; she has a nice collection of recipes. 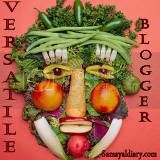 Sending this over to Food of the Month Contest at Food Corner. Start with preparing the dough. Mix all purpose flour, besan flour, salt and chilli powder in a mixing bowl. Add oil and mix it well. Add water little by little and prepare a stiff dough. Better you use as much less water as possible. Knead the dough well and apply some oil to the dough ball. Close it with a lid and let it rest for atleast 20 minutes before we start working. For the stuffing, mix all the ingredients and make a coarse powder. Check and adjust the taste according to your preference. Prepare small lemon size balls from the dough and roll them into thin circles using some dry flour (all purpose flour). 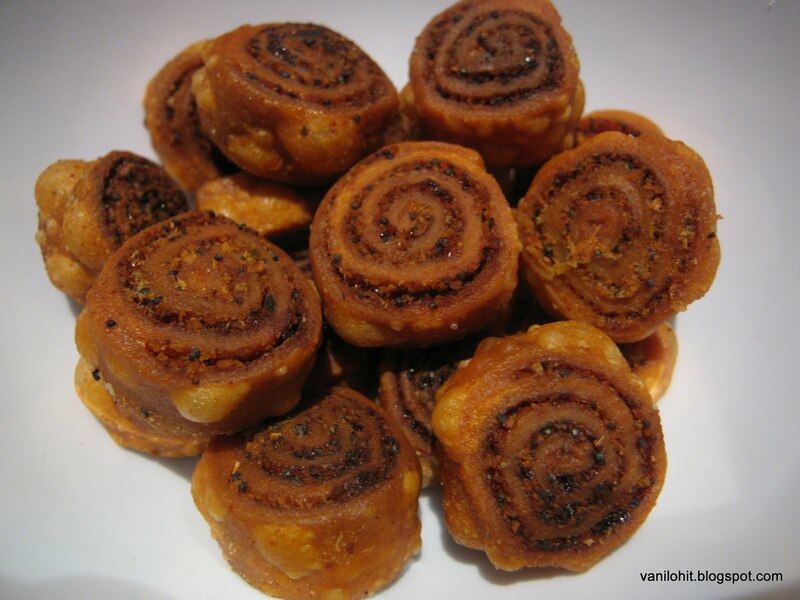 Apply the tamarind paste lightly to the rolled circle spread the stuffing evenly. Quantity of stuffing depends on the size of rolled roti. A thin layer of stuffing will be ideal. 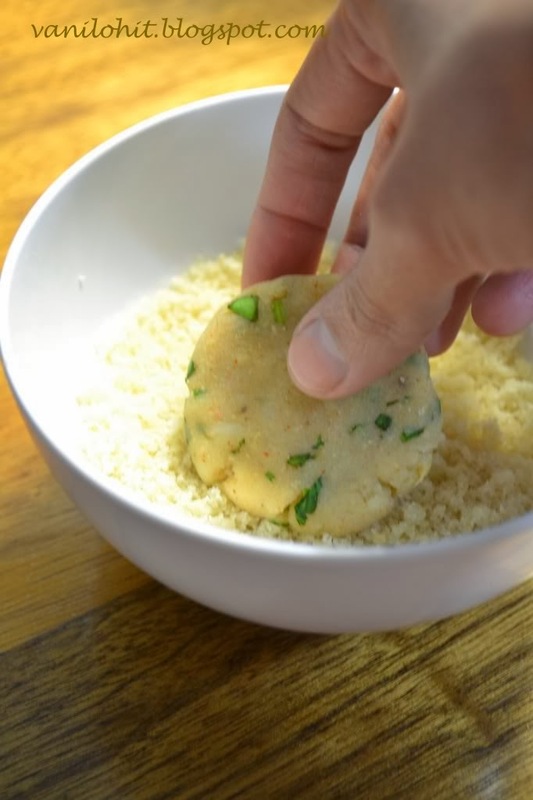 Lightly press the stuffing with your fingers to set it properly. Don't put the stuffing till the edges. Otherwise, stuffing will come out while deep frying. Apply tamarind pulp to the edges of circle and roll the circle tightly. press the roll lightly with your hands to make it set well. Then, cut it into pieces of 1 cm or required size. Prepare the paste using 1 spoon all purpose flour and little water. Dip both the sides of bakarwadi in the paste and deep fry on medium heat. This dipping will prevent the stuffing from coming out while deep frying. Deep fry the bakarwadi in batches on medium flame for atleast 10 to 15 minutes. Just 3 - 4 minutes taking them out, increase the flame lillte-bit to make them nicely colored. Keep them for cooling on a tissue paper and then, store in an air tight container. It will be nice to have them with a cup of tea or coffee. 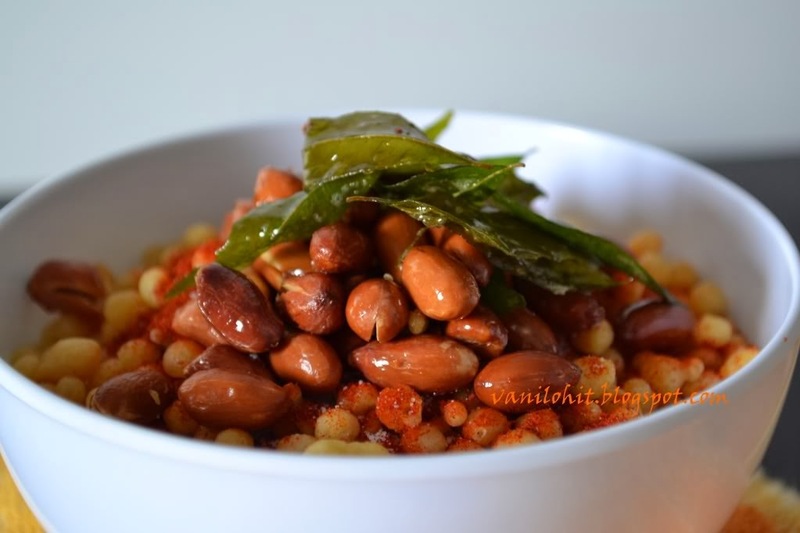 Again, one more recipe from my Kannada blog. For those people who are chaat lovers, sev must be familiar. Because sev is the main ingredient which enhances the taste of chaat items. 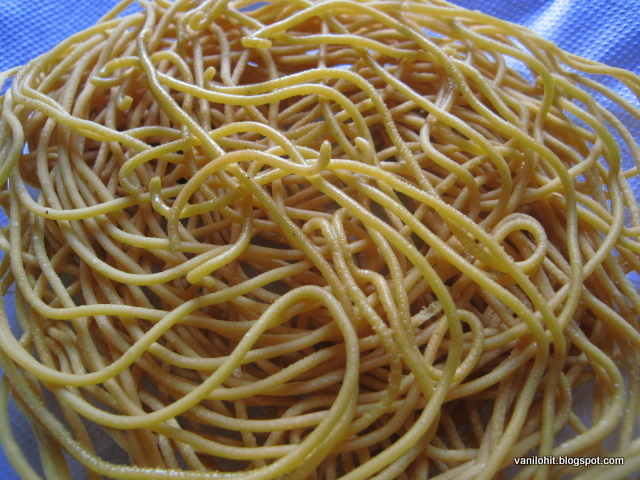 My mom prepares sev at home and she will prepare mixture using the sev. It will be very nice with a cup of tea or coffee. This sev will be slightly different from the store bought sev. That's why I renamed it as Masala Sev! It will be little more thicker than the store bought sev and will have a nice aroma of spices. This is the recipe from my mom. If this sev is there in my stock, I will use it for all the chaat items which I prepare. Grind the pepper, cumin seeds, carom seeds, green chillies, ginger and asafoetida into smooth paste using required amount of water. Filter the paste using the tea filter. Add some more water while filtering. This filtered water is for preparing the dough. Heat 5 - 6 spoons of oil and pour it on the besan flour. Add salt and mix it. Now, add the filtered water little by little and prepare a smooth dough. Dough will be bit sticky since we are working with the besan flour. Heat the oil in a heavy bottom pan. Fill the dough into the greased mould and press it into the hot oil. Within 2 - 3 minutes, sev will get cooked. Turn it on both the sides and fry until you get the golden color. Then, transfer it to a tissue paper for cooling. Continue the same process for rest of the dough. Press the sev bundle with your palms and make it into small pieces. Store it in an air tight container. You can eat this sev as it is, or use them for chaats or mixture preparation. We buy sweet potatoes very rarely. More than preparing the recipes, we love eating them cooked; wash the sweet potatoes thoroughly and pressure cook by adding water and 1 - 2 spoons of sugar. Drain the water, peel them and have it! You can cook them in microwave oven also. Another variety we like to have is sweet potato chips. It will be very tasty and simple to prepare. But how much ever you prepare, it will be consumed very quickly!! Wash and peel the sweet potatoes, make thin slices out of it. Heat oil in a heavy bottom pan and deep fry the potato slices on medium heat. Once they turn crispy and golden brown, transfer them to a tissue paper. Then, add 1 - 2 spoons of chips masala according to your taste and mix well. 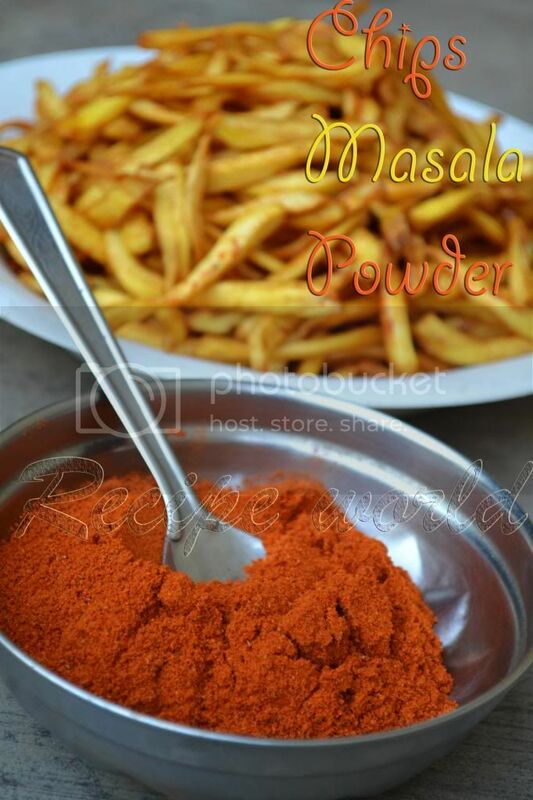 No need to add extra salt since masala powder contains salt. To make the chips nicely crispy, one nice tip from my cousin: Deep fry the chips and take out when they are 3/4th done; allow them to cool and again, deep fry them for 3 - 4 minutes. They will turn crispy easily. Dry roast all the above ingredients except chilli powder and amchur powder. Combine them and make a fine powder. To this, add chilli powder and amchur powder according to taste. 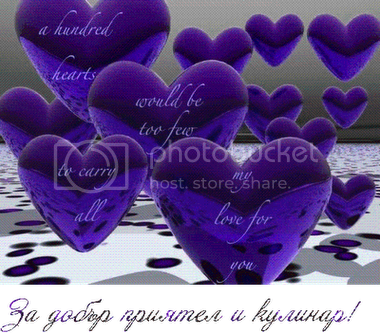 Transfer it to an airtight container and use when required. Better you prepare it fresh while preparing the chips. I have not added salt to this masala powder. 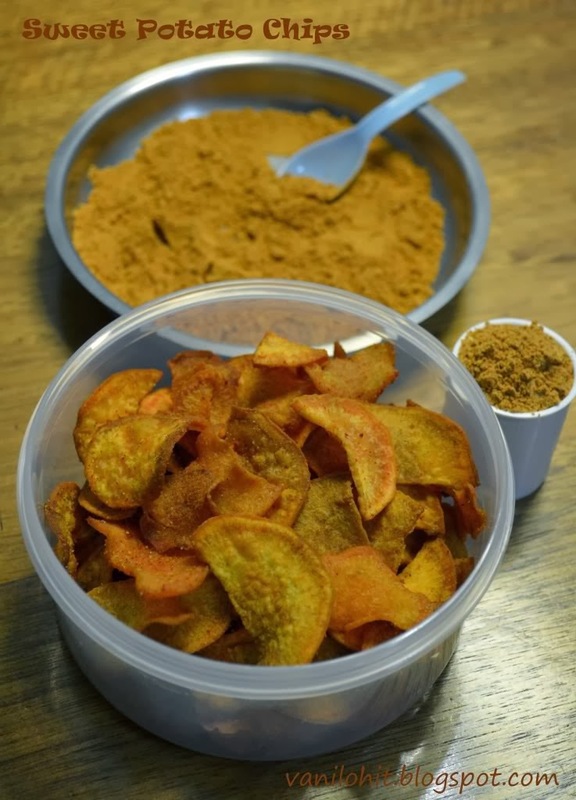 Either you can add salt while preparing masala powder or salt can be added directly while preparing chips. 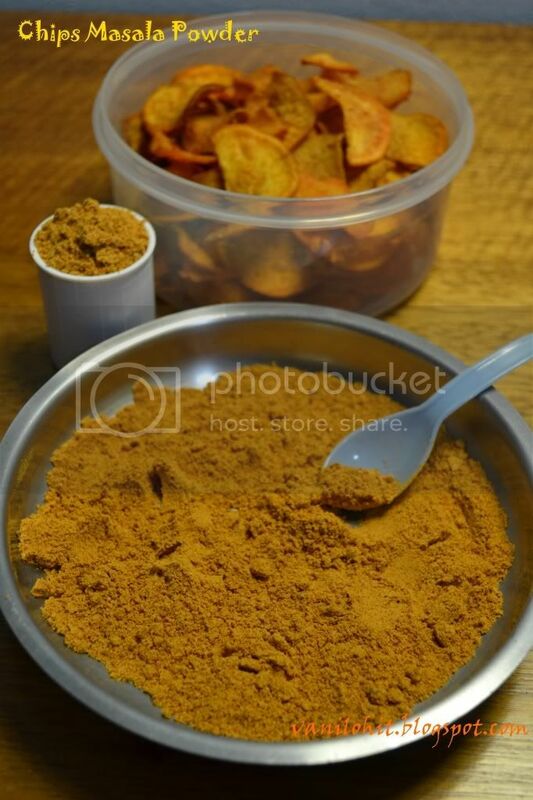 Left out masala powder can be used for preparing Palya or any other curries. Black eyed pea has a good nutritional value. So, I prefer using it often. 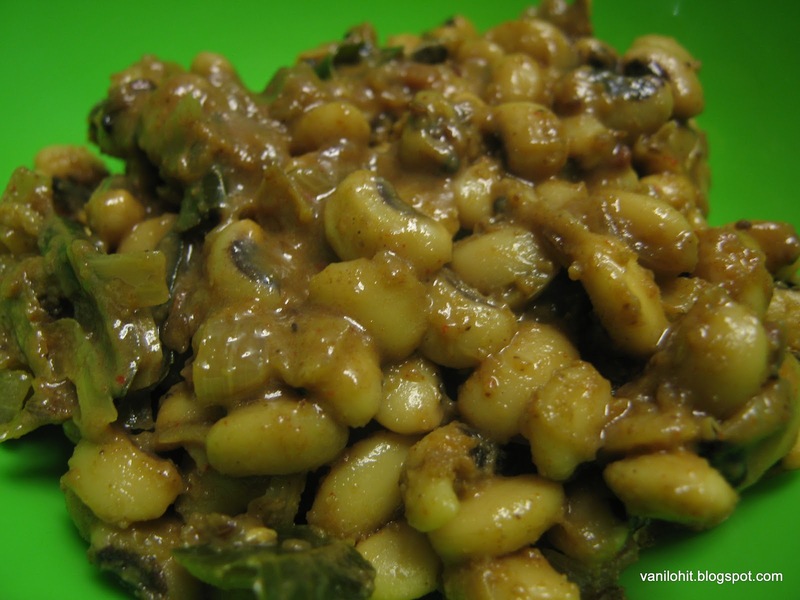 Daily I will prepare some or the other kind of side dish for chapathi and frequently I will go for Black eyed peas palya. Heat oil in a pan, add urad dal, mustard seeds and asafoetida. Once the mustard seeds start spluttering, add curry leaves and chopped green chillies. Saute them for a minute. Then, add the soaked black eyed peas, salt, sambar powder, amchur powder and sugar. Add water just enough to cover the Palya mixture and cook covered on medium flame. Saute them occasionally and add water, if required. Once the peas are almost cooked, add chopped onion and cook for 5 more minutes. By the time it is done, all the water content will be evaporated. If you wish, you can retain little water and make it a gravy. This Palya goes well with roti, chapathi or dosa. I had a packet of Bisibele Bhath Powder sitting idle in my freezer from couple of months. To be frank, we were getting bored with the same taste of store bought powder. Somehow, we finished it successfully and I started searching for a bisibele bhath powder recipe in the net. Finally, I got a nice recipe and prepared the bisibele bhath powder at home. Then, I thought of preparing the Boondi, a combination with Bisibele Bhath, at home. Boondi came out very well and I am thinking of preparing it at home now onwards.. 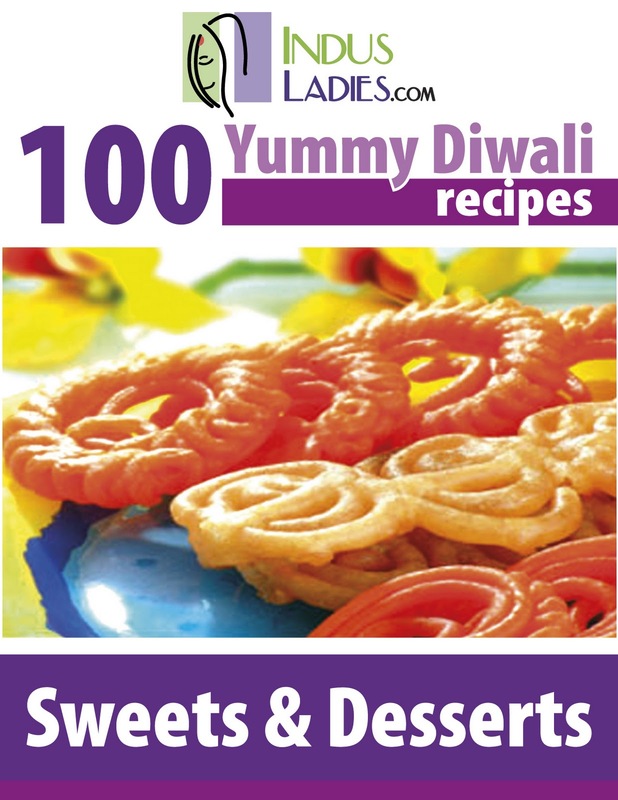 This boondi is slightly different from the boondi which we prepared for Boondi laddoo. For boondi laddoo, boondi should be smooth and for Khara (Spicy) boondi, it should become nicely crispy. This can be done by adding a few spoons of rice flour to the batter. 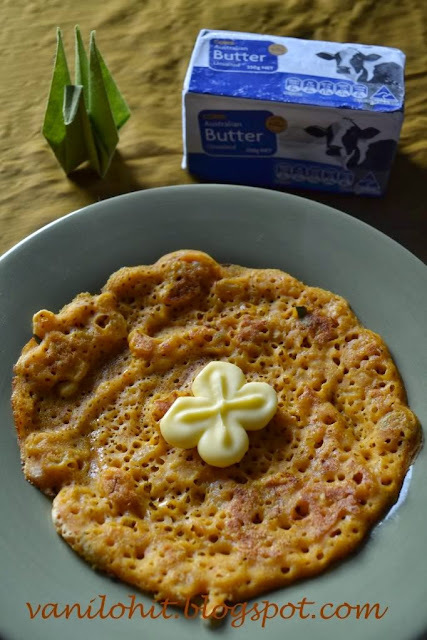 Check out the recipe below and try it out! Mix the besan flour and rice flour in a mixing bowl. Add water little by little and prepare a thick batter without any lumps. To this, add 3 - 4 spoons of oil (cold) and mix it. 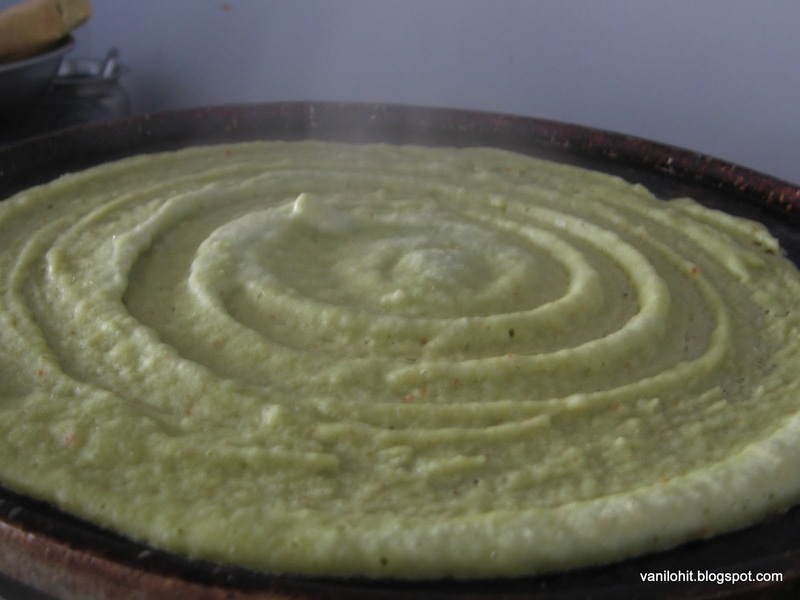 By adding oil, it helps the batter to flow nicely while preparing the Boondi. Thanks to Vah Chef for this tip! 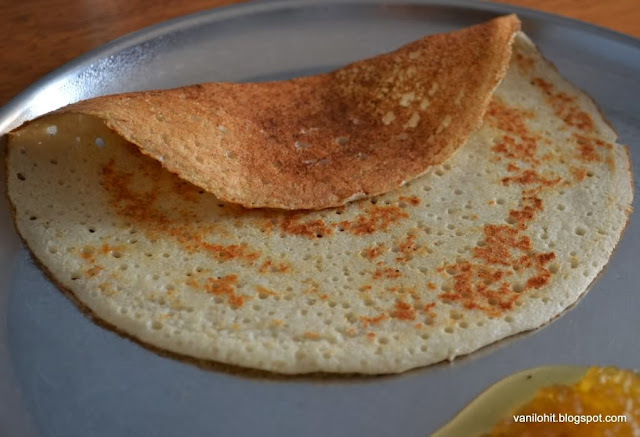 Batter should by in a nice, pouring consistency; little thinner than the dosa batter. Heat the oil in a wide pan. Once the oil is nicely hot, pour 1 - 2 ladle full of batter onto the Boondi ladle and let the round drops of batter fell into the hot oil. Deep fry them till crispy and golden brown, and transfer the Boondi onto a tissue paper. 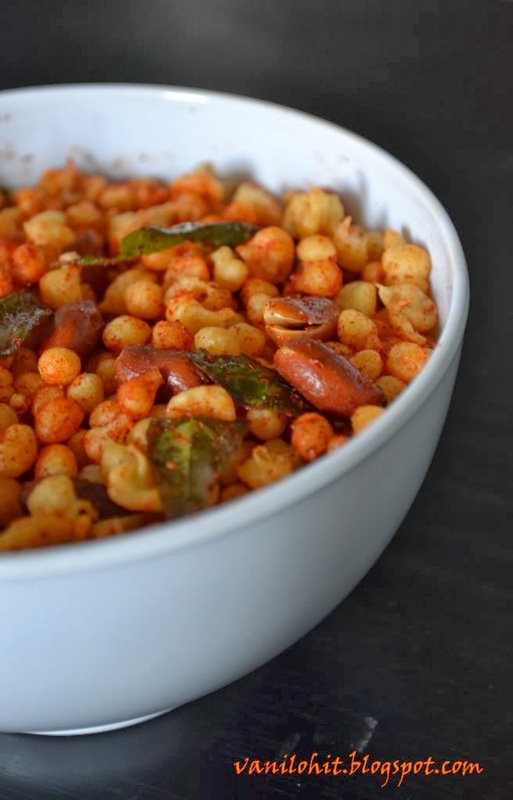 Once all the Boondi is done, deep fry the groundnuts and curry leaves separately in the same oil. Mix the groundnuts and curry leaves with Boondi. Add salt and red chilli powder according to taste. 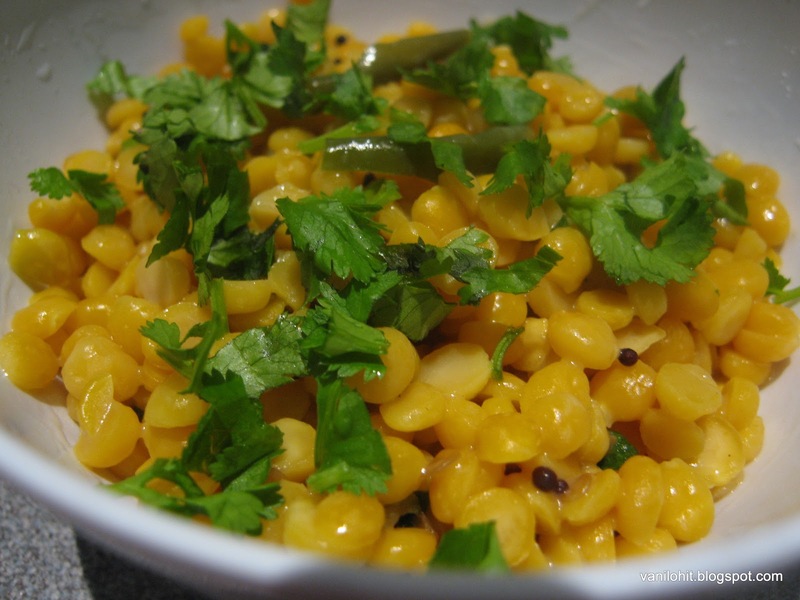 Mix all the items thoroughly and store the Khara (Spicy) Boondi in an airtight container. Khara Boondi can be eaten as a snack, or can be used to prepare the mixture, or can be served with Bisibele Bhath. Also, it goes well with rice and sambar. If the Boondi is becoming flat and not round balls, just add 1 - 2 spoons of besan flour to make the batter thick. For me, first few batches came out well and then, it started becoming flat. I added little more besan flour and it came out perfect. Linking it to Food of the Month Contest at Food Corner. Again, this is an old posting from my Kannada Blog. 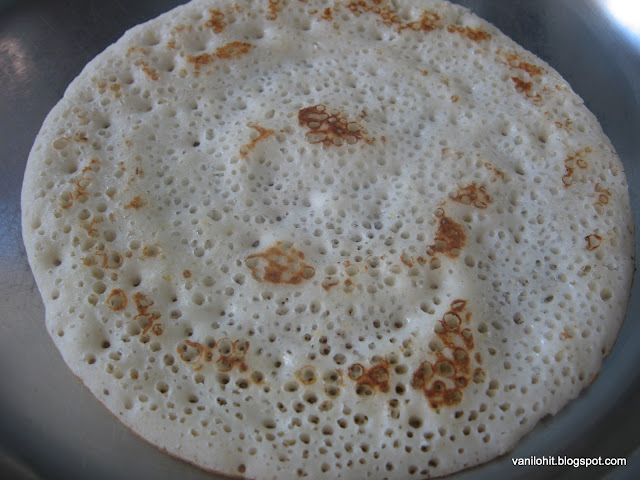 During winter time, I was searching for some dosa varieties which won't need fermentation. 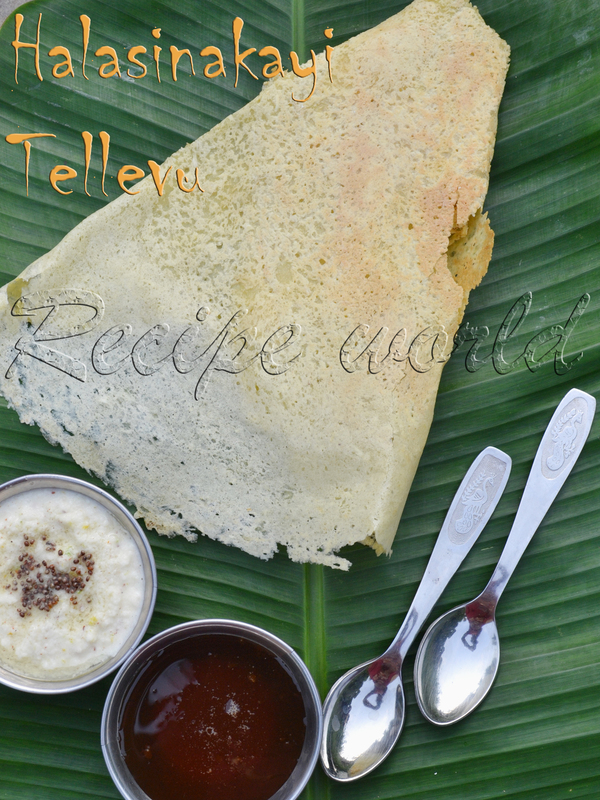 I just stopped by Rashmi's Blog and found this healthy and delicious Adai Dosa recipe. 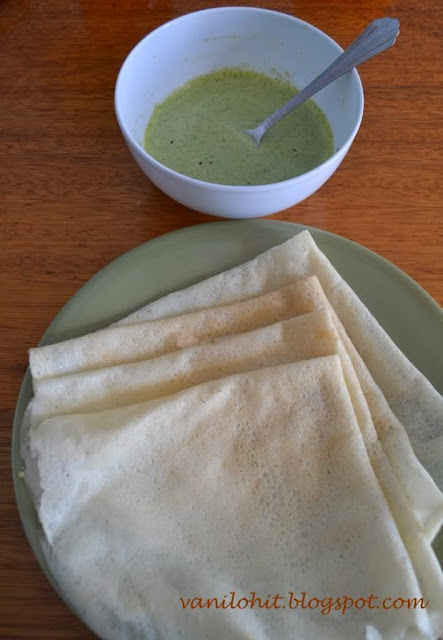 This has become one of our favorite dosa these days and I thought of sharing the same with you..
Soak all the lentils, fenugreek seeds and rice for 4 - 5 hours or overnight. 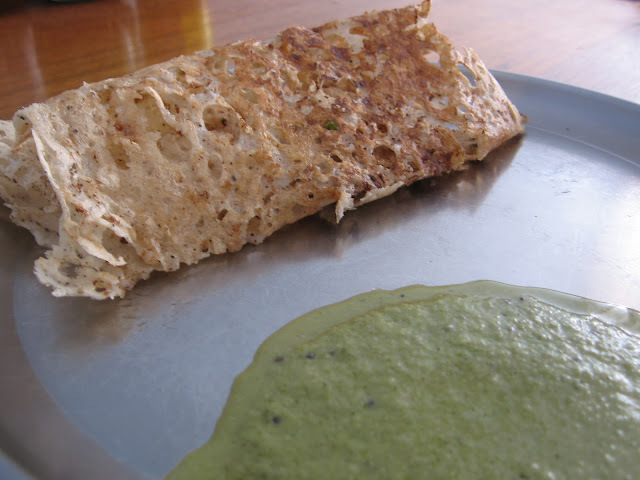 Grind them with asafoetida, curry leaves, ginger, coriander leaves and green chillies and prepare the dosa batter. 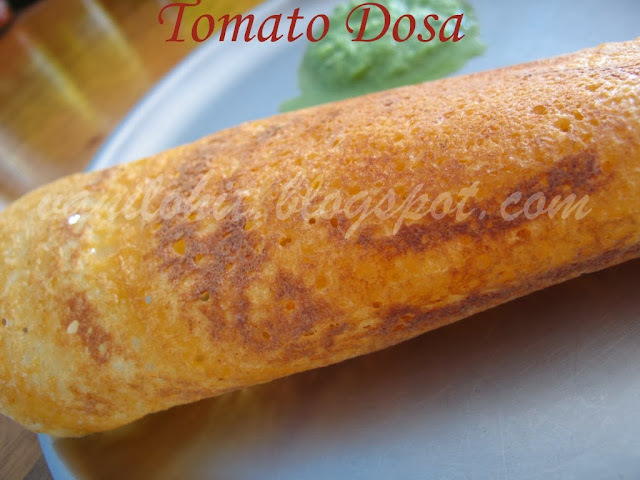 Heat the dosa pan and pour 1 ladle full batter onto it. Spread the batter evenly using the ladle. Apply few drops of oil and cook on both the sides. Aloo Tikki is a famous snack item from North India. 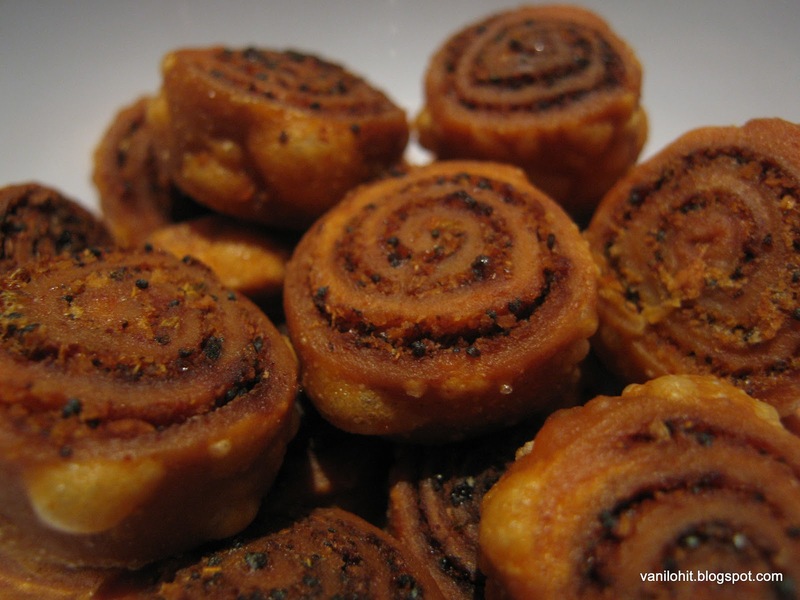 Everybody likes eating these kind of snacks at chat counters in the evening time. But, preparing Aloo tikki at home is damn easy! 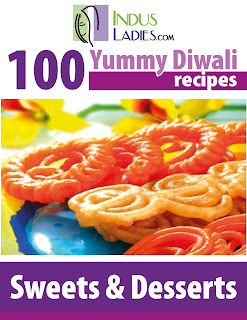 Just adjust the below ingredients according to your taste, and you can prepare wonderful tikkies! It goes well with evening tea..
Cook the potatoes smoothly, remove the skin and mash them nicely. Better you drain as much water as possible. Combine all ingredients except oil and bread crumbs with mashed potatoes and mix well. Add bread crumbs to the mixture and form a chapati kind of smooth dough. Make small lemon size balls from the dough and flatten them little-bit. 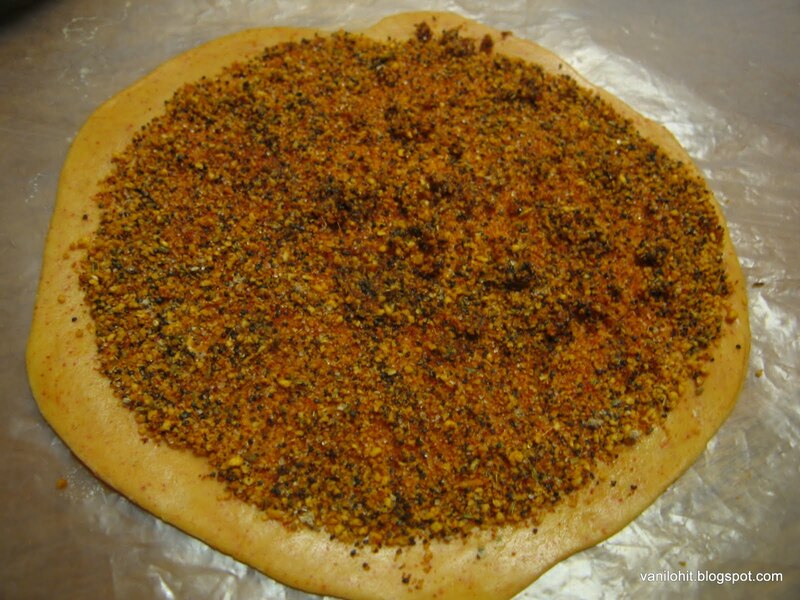 Dip them in bread crumbs and let the bread crumbs get stick on both the sides. Heat the flat tava and shallow fry the tikkis using the oil. 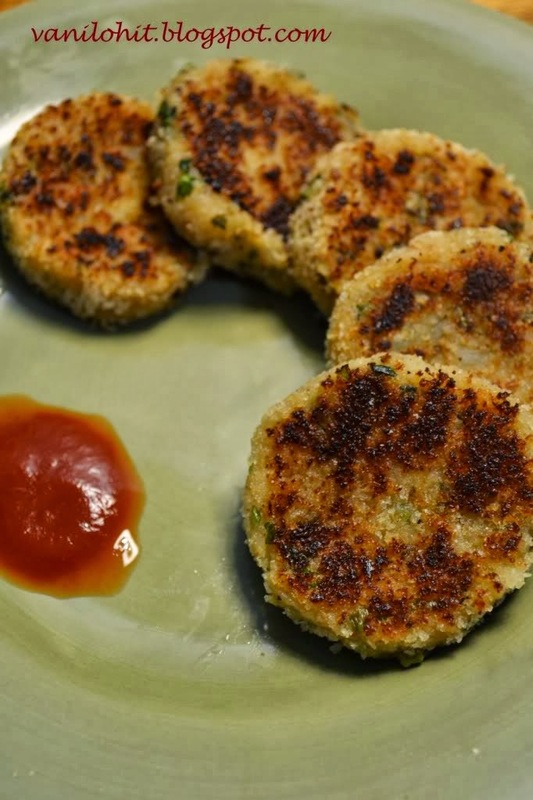 Once the tikki is done on both the sides, serve them hot with Red chutney or Tomato sauce. Here is an easy technique to prepare bread crumbs at home: Take some left over bread pieces and dry them. You can dry they quickly using the microwave oven. Cut the bread into small pieces and crush them in mixie jar and make a course powder. Bread crumbs are ready for use!